The Chequers Inn01485 512229work RestaurantThis beautifully renovated former coaching inn on the North Norfolk coast offers a variety of areas to dine, relax and enjoy a laid-back informality. The service is charmingly chummy and atmosphere is calm and relaxed. Inside you will find a traditional bar with a warm country feel, a vast open fire and low beamed ceiling. Enjoy a pint of real ale and a pub meal by the crackling fire, or try the a la carte menu with daily changing specials in the contemporary dining room. There are also 11 stylish bedrooms, recently refurbished with a coastal theme. Peruse Head Chef, Shayne Wood's, seasonal and irresistible menus. Shayne is passionate about local, high quality produce and seafood, including the famous Brancaster mussels. All our food is home made on the premises, using ingredients that are sourced and supplied from local producers. Our menus suit every taste including hearty Sunday lunch, a la carte dishes, a selection of Norfolk tapas and stone-baked pizzas. 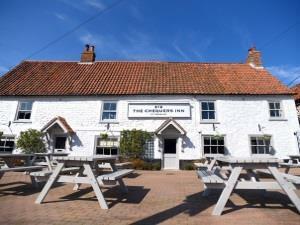 The Chequers Inn is located on the High Street next to All Saints church in Thornham village.